Given the gravity of the issue and its epicentre, the Jawararlal Nehru University (JNU) incident was bound to create ripples internationally. World media has given extensive coverage to the gargantuan protest sparked by the arrest of JNU students' union president Kanhiaya Kumar, linking it to the escalating intolerance debate in India. It all started with an event organised on 9 February at the university where a handful of students reportedly held a meeting to protest what they called "the judicial killing of Afzal Guru and Maqbool Bhat". 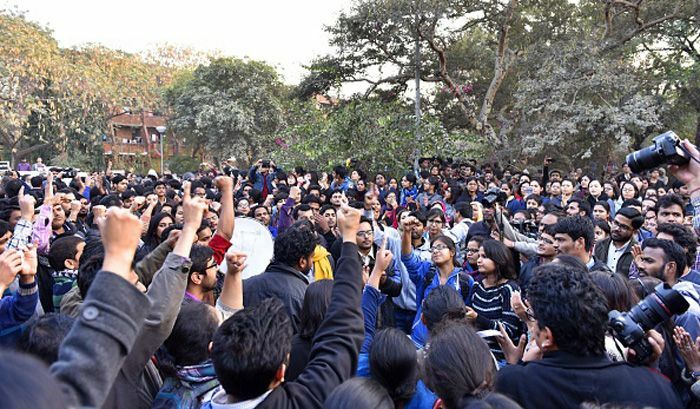 The gathering quickly turned controversial with some students raising "anti-India" slogans. Sedition charges were slapped against the protesters and police arrested Kanhiaya Kumar. Tension mounted when lawyers (reportedly linked with the Bharatiya Janata Party) allegedly beat up students and journalists on 15 and 17 February. Here is how the foreign media has covered the incident so far. Focusing on the clash between the left and the right, BBC headlined the piece as "Why an Indian student has been arrested for sedition". 'Many of the students believe that the move is a direct assault on their right to dissent', it further says. The piece also talked out about the sharp divisions in India over the-----. It goes on to quote Surajit Mazumdar, an economics professor, who described Kumar's arrest an attempt to "terrorise the students into submission". The report in the Guardian reads- "The reaction of authorities to the protests at JNU - which is well-known for its politically active student body - comes against a background of what critics say is rising intolerance in India since Narendra Modi's BJP came to power in a landslide election 2014." "The government has repeatedly been accused of seeking to repress free speech and of encouraging extremist nationalists who systematically intimidate critics", it added. Commenting further on the resistance, the piece reads - "Educational, cultural and academic institutions are fast emerging as a key battleground between a broadly secular left and Hindu nationalists." Recalling the recent student protests in Hyderabad and Pune, LA Times wrote- "Supporters of the governing Bharatiya Janata Party, a conservative Hindu organization, previously clashed with lower-caste students at a university in southern India and students at a prominent film institute who opposed Prime Minister Narendra Modi's appointments to the school's governing body." "In each case, the student demonstrators have been accused by BJP officials and authorities of anti-national behavior. Kumar is the first student to face charges of sedition, under a colonial-era statute that was enacted to protect the country's former British rulers but is now often used to discipline government critics," the report said. Narrating Home Minister Rajnath Singh's goof-up, the report mentioned- "Singh later caused the government some embarrassment when he said that Hafiz Saeed, a Pakistani militant leader who has allegedly masterminded attacks against India, supported the JNU student. A tweet in which Saeed purportedly backed the protest turned out to have come from a parody account, and the militant took to social media on Monday to needle the Indian government." Giving the details of the incident and protest, the Washington Post went on to comment on earlier incidents where people have been charged with sedition in India. "The sedition law has been invoked repeatedly by various governments against dissenters, including a cartoonist, students cheering for a Pakistani cricket team, anti-nuclear activists, protest-singers and human rights advocates. Human Rights Watch has urged India to repeal the law, which carries a minimum of three years in jail and a maximum punishment of life imprisonment", the story read. It also mentioned that some analysts believe that Modi's government has deliberately tried to quell student activism on campuses in the past year. The piece also quoted Rahila Parwen, Vice President of the Delhi unit of the All India Students' Federation (AISF) saying that - "The government does not want students to have a say" and that "it wants to dictate what students think, understand and say." Taking about the political orientation of JNU the piece mentioned- ''Of the universities in India, JNU is considered to be highly democratic. Though strongly influenced by the political left, the university has always been a fertile ground for discussions on diverse political and ideological opinions."